Well that’s it from GUKPT London. Leg 1 of the 13th season of the UKs longest running tour is in the histoy books. It’s been an unbelievable turnout with 467 entries in total, the biggest EVER £1000 GUKPT Main Event! It’s been a long day today, playing almost 13 hours of poker but we have a new champion! Commiserations goes to Alexios Zervos who has unfortunately finished runner up again! This time for £80,000! 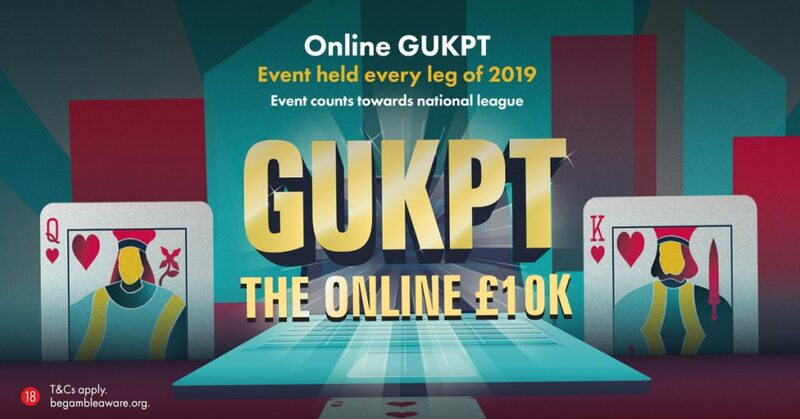 The next GUKPT Leg will take place in Manchester during the second week of March. Join us then where we are expecting another big turnout. 1st – £100,000 – J.V. Alexios Zervos gets very unlucky two spots for the trophy and is left with just ten bigs. He gets it all in holding and is in bad shape against the of J.V. Flush for J.V as he takes the final hand of the tournament. 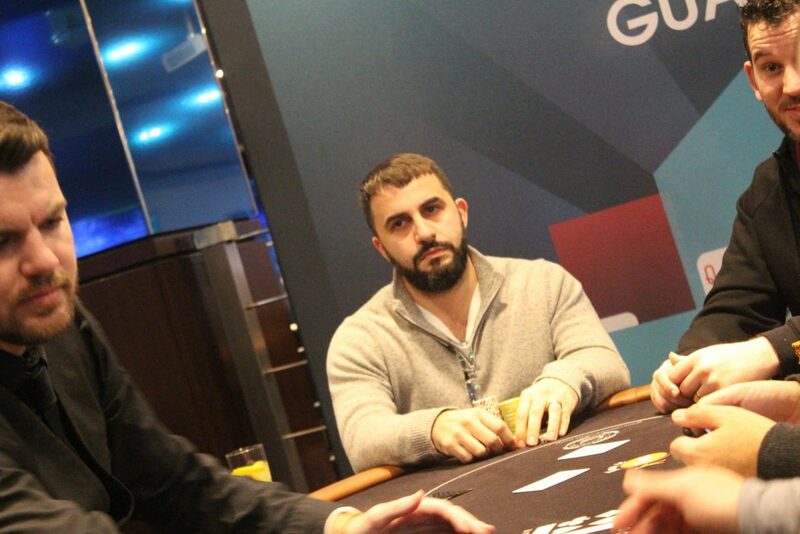 Alexios Zervos takes home £80,000 for finishing as the runner up. 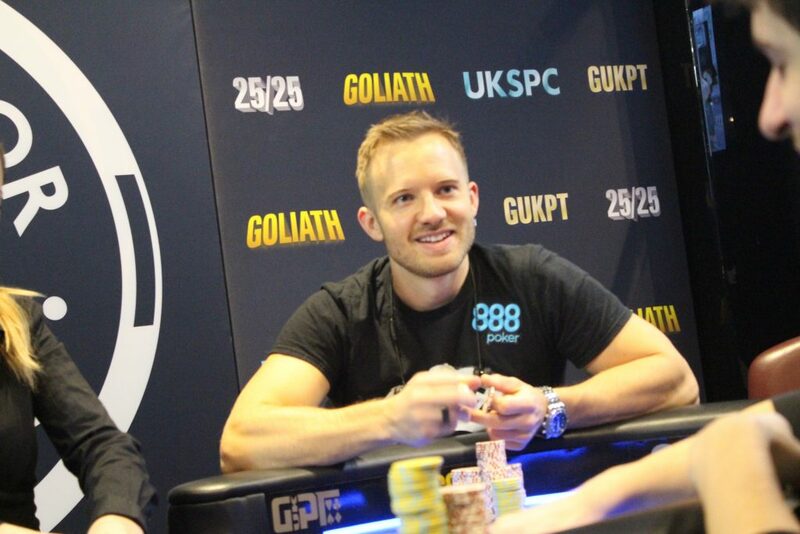 J.V wins the GUKPT London Main Event for £100,000! Paul Siddle gets it all in with top pair and a gut shot against the two pair of Alexios. 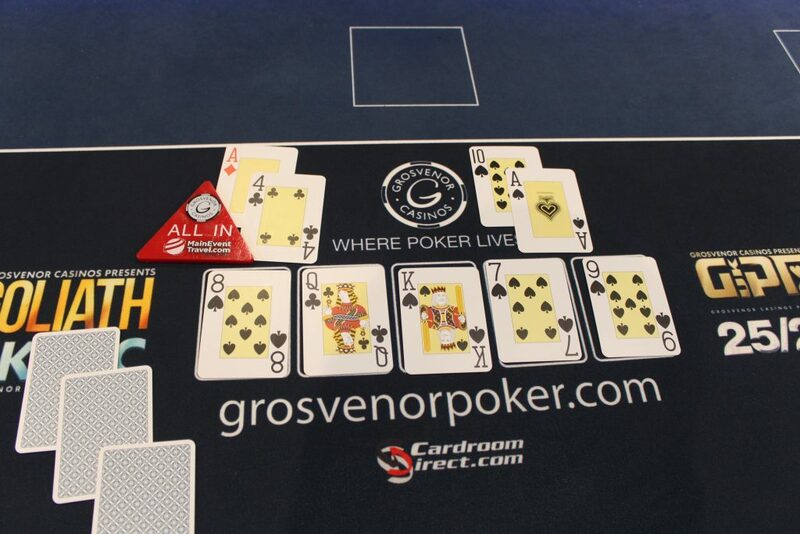 The two pair holds and we lose Paul Siddle in 3rd place for £60,000! Zack O’Sullivan moves all in for his 10 bigs and is called by J.V. Zack shows and has live caards against the of J. Ace on the flop then nothing silly from the dealer and we lose Zack O’Sullivan in 4th place for £45,800. The blinds increase as we begin level 31. They are now 60,000/120,000 with a 10,000 ante. Alexios Zervos opens, J.V. three bets, Alexios moves all in and J.V calls. Alexios makes a flush doubling up to 4.6million, which is half the chips n play. J.V is now down to 2 million. The players are back seated as we begin level number 30. Average stack is 23 bigs so the tournament is shallow now. There should be some action this hand. A deal has been done between the players, flattening the payouts. S.B moves all in for his 9 bigs stack and is called by Alexios Zervos. S.B tables and is in bad shape against the of Alexios. The jack plays as Alexios takes the pot and now has 2.5million. S.B finishes in 5th place for £20,100. The blinds increase as we begin the nextx level of play. They are now 40,000/80,000 with a 10,000 ante. Atanas gets his short stack of 250,000 all in holding against the of Zack. The flop comes giving Atanas a pair, Zack flops an open ended straight draw. The turn card comes giving Zack a set and the lead. 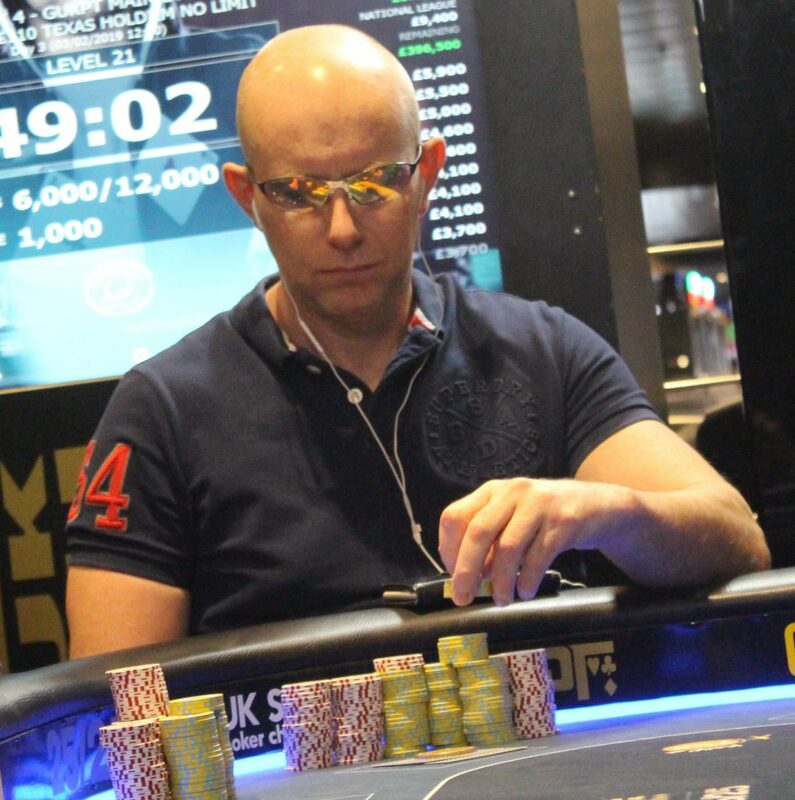 We lose Atanas Pavlov in 5th place for £14,600. The cards are in the air as we begin level 28. All is very quiet on the final table with zero action to speak of. There are 6 players remaining and they are guaranteed £14,600. 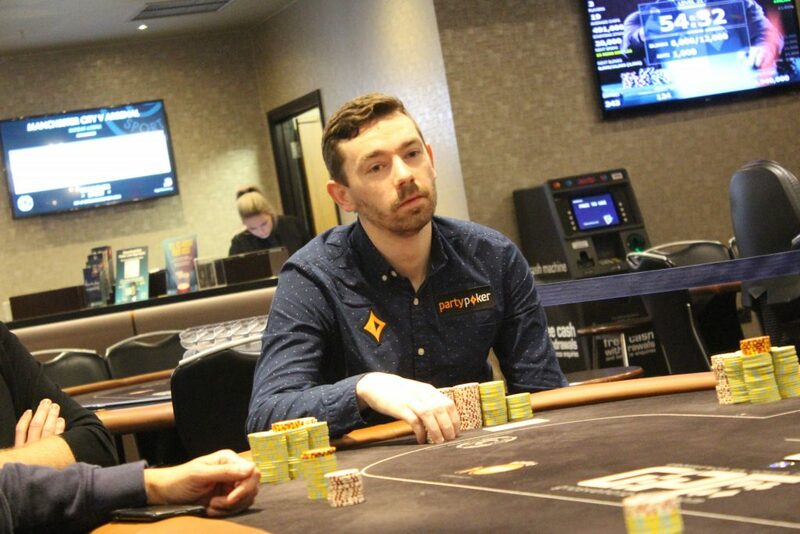 Andrew Garland has just been eliminated in 7th place for £11,500. A great cash after Andrew had just a small blind mid way through Day 2. The ONLINE £10k is currently ADDING £5,000 on Grosvenorpoker.com !! A massive overlay with late registration open until 9pm tonight. Get yourself on Grosvenorpoker.com for some added value. On a board reading Zack O’Sullivan bets 250k, Chris Kadji moves all in for around 600,000 and Zack makes the call. Zack shows for an over pair, Chris is at risk and tables for top pair and a flush draw. The aces hold for Zack as he takes the pot and now has 2 million chips. We lose Chris Kadji in 8th place for £9,100. 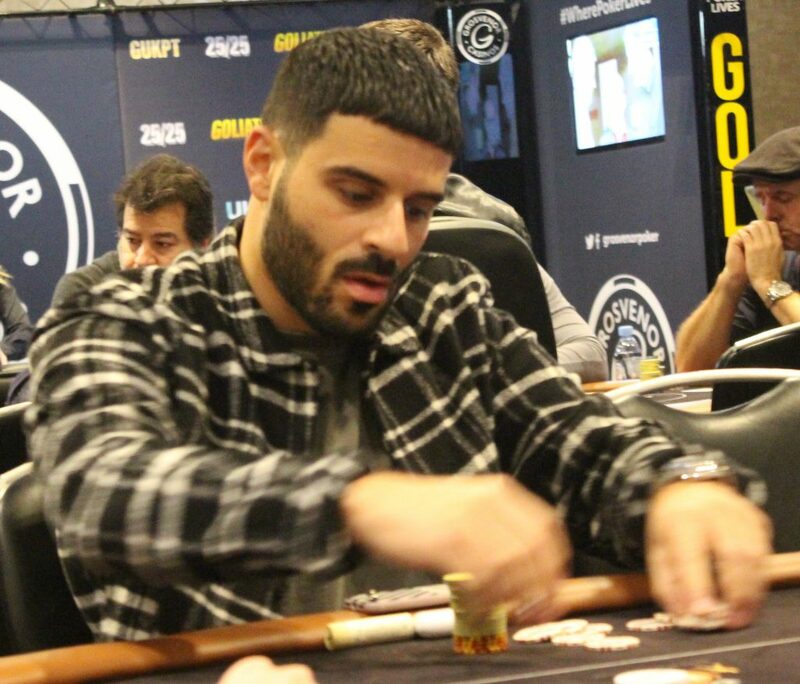 We lose our first player from the final table in Andreas Orthodoxou! He heads out in 9th place for £7,400! The players are back seated to begin the next level of play. The blind are now 20,000/40,000 with a 5,000 ante. J.V opens, Andrew Garland three bet shoves his ten big blinds, J.V makes the call. The turn card comes giving Andrew a flush draw. 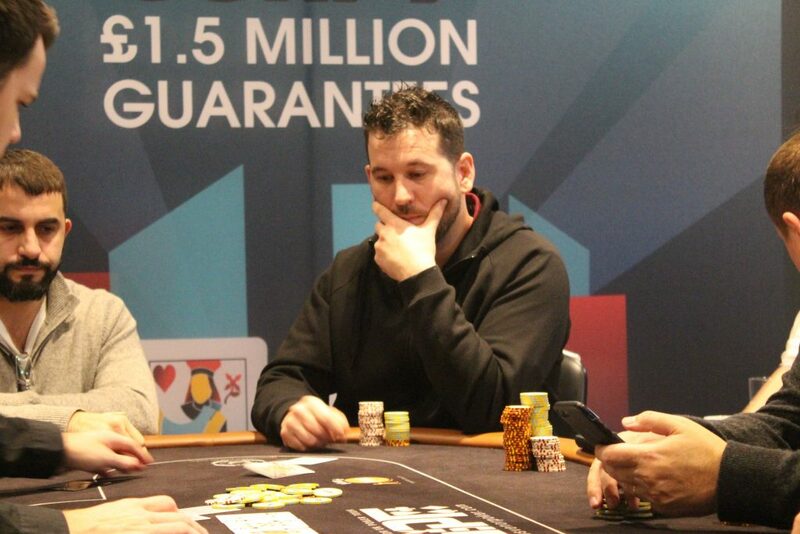 Andrew rivers top pair and will double up to just over 700k. No action to speak of during the first level of the final table. Players are just getting a feel for the table and hopefully they will open up when the blinds increase in a few minutes. The final table is now underway! 9 players remaining with 45 minutes on the clock. Blinds are 10,000/20,000 with a 2,000 ante. Break time for the players as they take 15 minutes before beginning the final. We lose Richard Harrison in 10th place. He bubbles the final table bubble taking home £6,400. 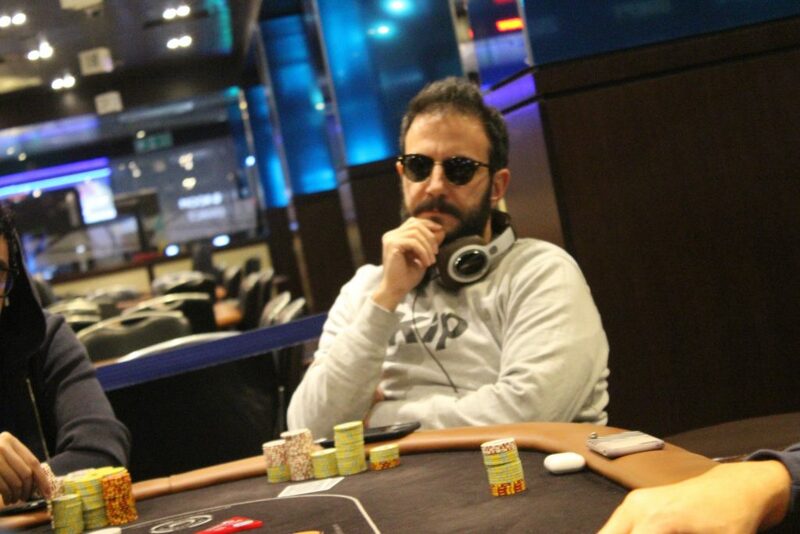 Adel Benmessaoud moves all in for 200k and is called by Alexios Zervos. It’s a flip as Adel tables against the of Alexios. Flush for Alexios as he takes the pot. 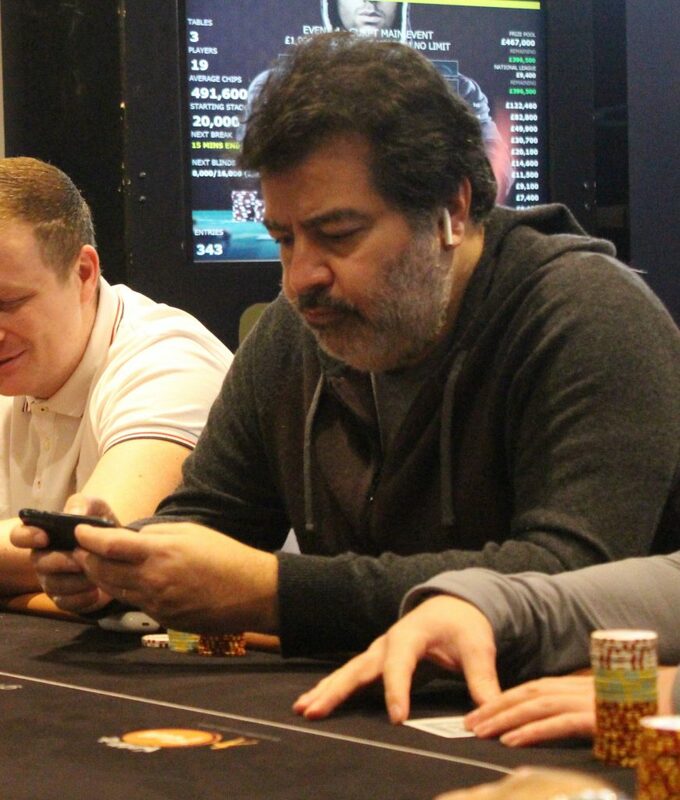 We lose Adel Benmessaoud in 11th place for £5,900. Yazan Mdanat gets his last twelve big blind all in holding and is crushed by the of Richard Harrison. Two pair for Richard as he takes the pot. 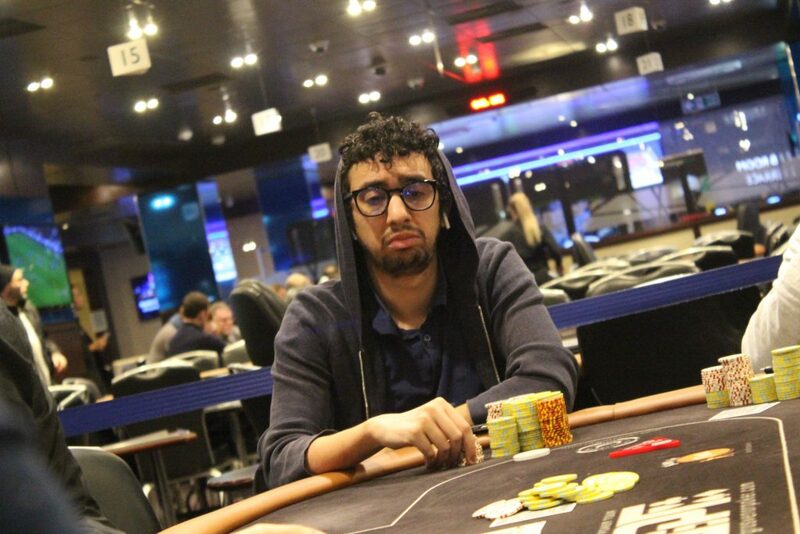 We lose Yazan in 12th place for £5,500. Chris Howden opens, Zack O’Sullivan three bets to a massive 400k. Chris goes to shove, but accidentally leaves 130k behind, so it’s classed as a called. The flop comes Zack moves all in and Chris quickly puts in his remaining chips. Chris shows and has been out flopped by the of Zack who has flopped top pair. Zack takes the pot and now has around 1.7million. We lose Chris in 13th place for £5,500. We lose Zack Chesses from the tournament in 14th place for £4,600. 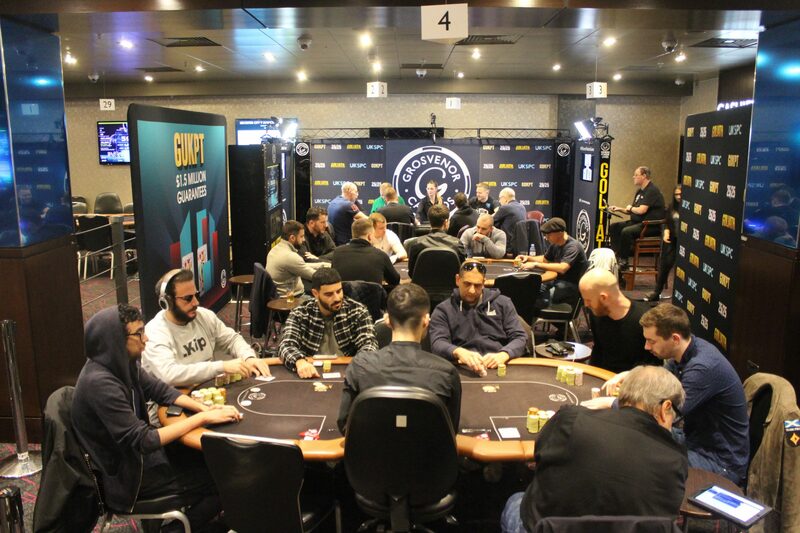 Just 13 players remaining now in the GUKPT London Main Event. 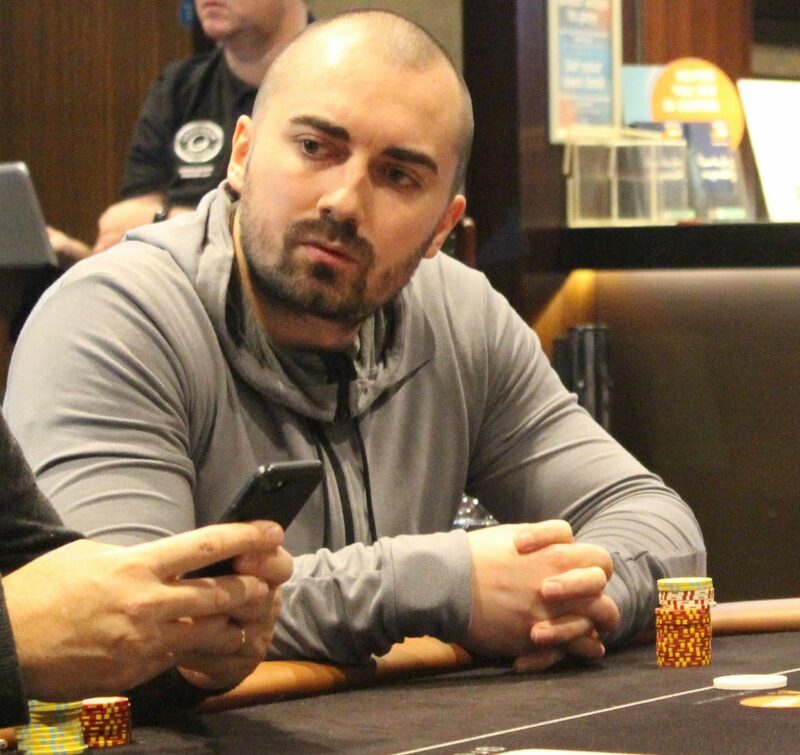 Alexios Zervos moves all in for his stack of around 340,000, Victor Ilyukhin calls off his 250k stack putting himself at risk. Victor has found against the of Alexios. Alexios makes two pair on the river to take the pot and bust Victor. 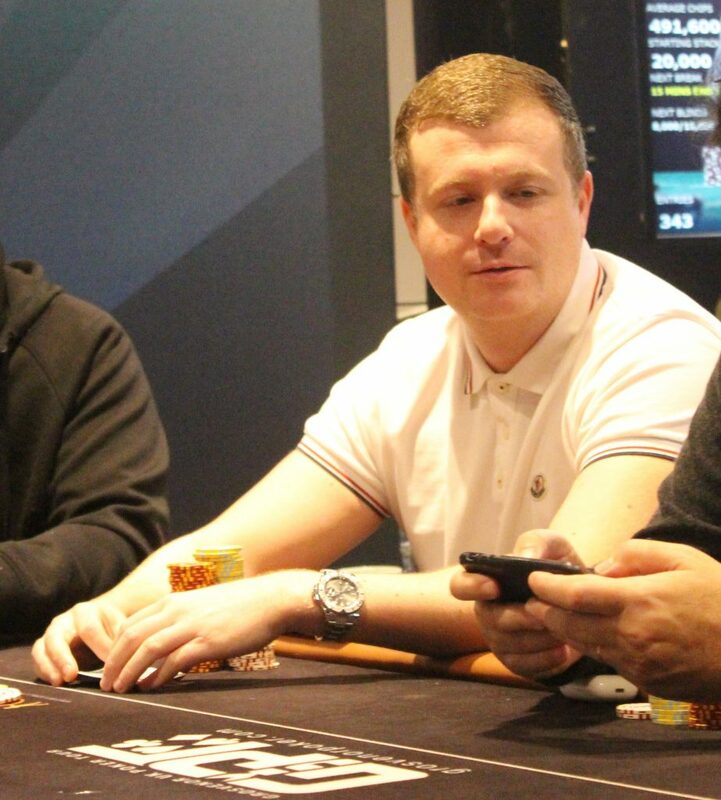 We lose Victor Ilyukhin in 15th place for £4,600. The players are back seated as we begin the next level of play. All is quiet during the second level of today as we approach the break. Full chip counts of the remaining players will be up with you when we take a break in 15 minutes. J.V. calls an open and is met by Patrick Uzan who shoves for his 340,000 stack. J.V makes the call. It’s a coinflip as Patrick shows against the of J.V. 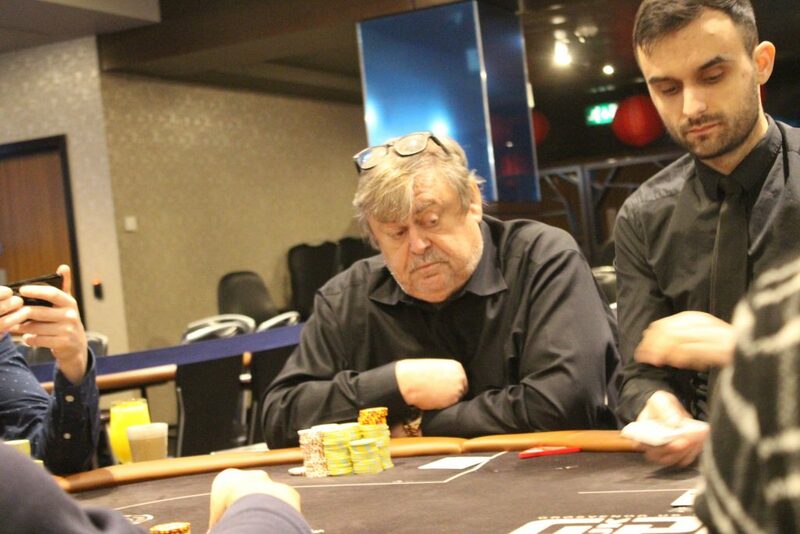 No help for Patrick as he heads out in 16th place for £4,100. Ace on the flop and we lose Ludo in 17th place for £4,100. Paul shows against the of Martin. The flop comes giving Martin a gut shot to broadway. 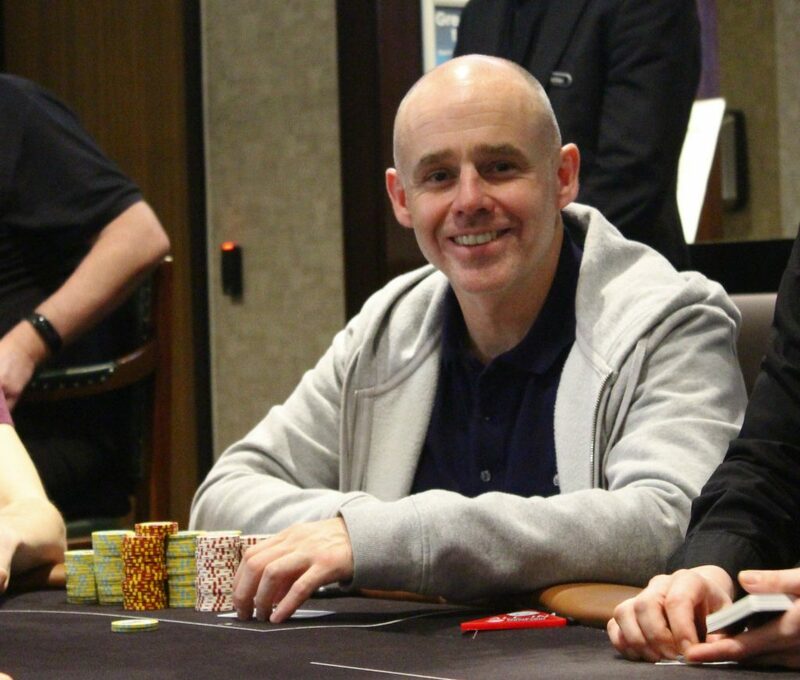 Brick brick for the former world champ as he busts in 18th place for £4,100. Chris takes the pot with one pair. Steven heads out in 19th place for £3,700. 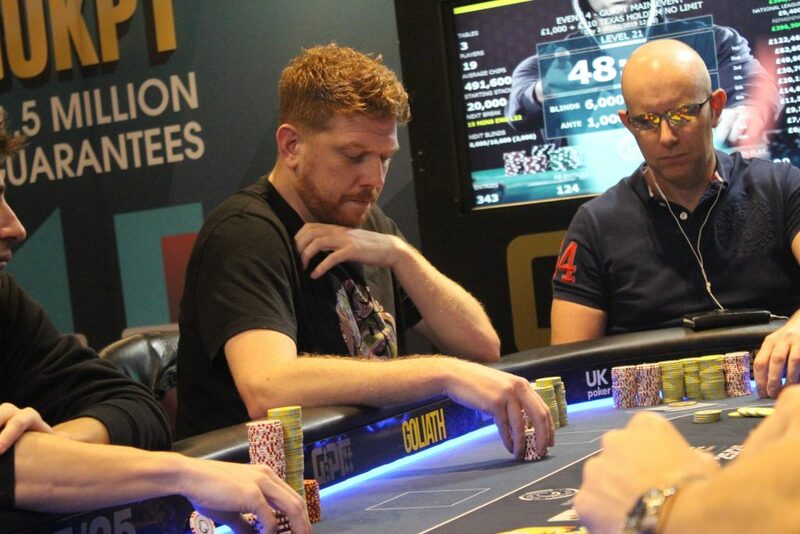 No help for Mitch and he busts in 20th place for £3,700. The blinds are 6000/12000 with a 200 ante. The players have been called in to take their seats. Good morning and welcome back to The Poker Room for the third and final day of the tournament. From the 467 entries we have just 20 players making their way back today to play down to a winner! The players are guaranteed £3,700, but all have their eyes on the first place prize of £122,460. Play begins at 12pm today and we’re looking forward to what should be a great day!